Basic Life Support offers great training for first aiders with an extensive range of CPR simulators. They are designed with life-like features and durable construction for long-term use. Each simulator enables hands-on practice for every student and gives different types of direct feedback. CPR Lilly™ is suited for the evaluation of the trainee's CPR performance using direct feedback, while Basic Billy are used for larger group trainings. 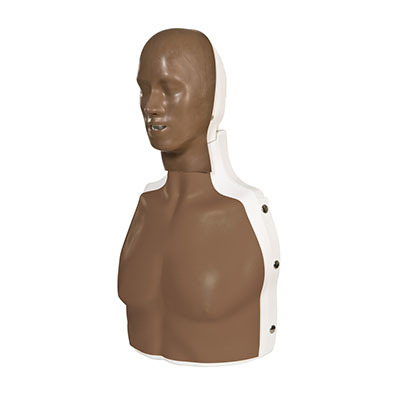 The CPR Lilly™ is a CPR training manikin developed to operate economically for a long time thanks to the use of disposable airbags and a separate air chamber system. This CPR simulator is also extremely hygienic: the face masks can be cleaned and exchanged easily. All material used throughout the production process complies with the highest standards in terms of quality and durability and is nonhazardous. To reach the best training results possible, various feedback methods have been built into the manikin. A tone (which can be deactivated) will sound when the correct compression depth is reached. The carotid pulse and the eye movement can be controlled individually by hand and can react to the trainee by opening her eyes when spoken to. The upper body, dressed in everyday clothing with a zip jacket, shows all the important anatomical reference points. 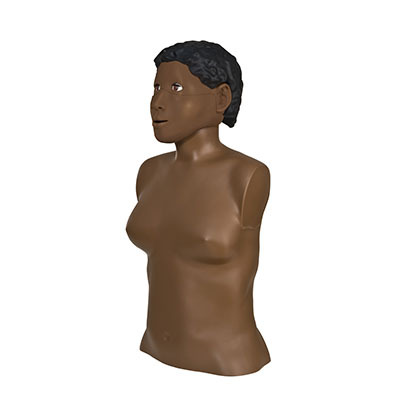 In addition to these features, the correct head tilt and the moveable jaw to demonstrate the jaw thrust maneuver, make CPR training with CPR Lilly™ as realistic as possible. This CPR trainer has been developed and manufactured in Germany, and training with this manikin complies with the latest AHA (American Heart Association) and ERC (European Resuscitation Council) guidelines. Included with the CPR Lilly™ is: 5 Lower face masks (including teeth), 25 Throat bags, 1 Carry case and 1 Tracksuit top. 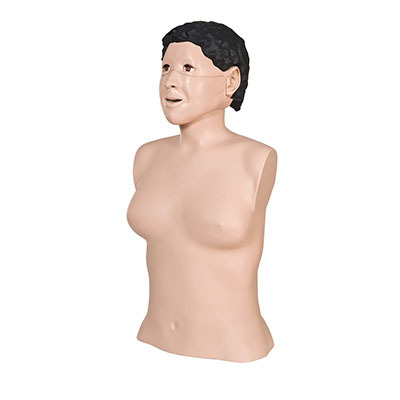 Dimensions: 34.0" x 13.0" x 21.0"
Dimensions: 9.1" x 30.3" x 18.1"
The CPR Lilly PRO™ is a CPR training manikin developed to operate economically for a long time thanks to the use of disposable airbags and a separate air chamber system. The Pro version includes the training tablet that uses software, that can guide the exercises and control the simulator, creating highly realistic training scenarios. All the relevant parameters can be monitored comfortably and easily via the tablet provided and stored away for subsequent analysis. This CPR simulator is also extremely hygienic: the face masks can be cleaned and exchanged easily. All material used throughout the production process complies with the highest standards in terms of quality and durability and is nonhazardous. To reach the best training results possible, various feedback methods have been built into the manikin. A tone (which can be deactivated) will sound when the correct compression depth is reached. The carotid pulse and the eye movement can be controlled individually by hand and can react to the trainee by opening her eyes when spoken to. The upper body, dressed in everyday clothing with a zip jacket, shows all the important anatomical reference points. 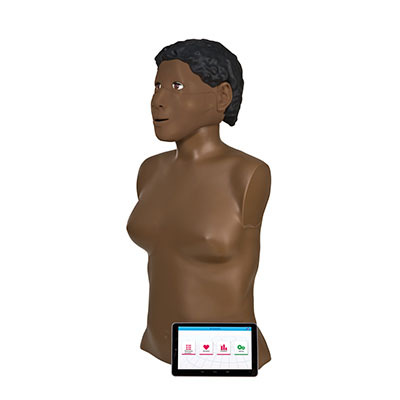 In addition to these features, the correct head tilt and the moveable jaw to demonstrate the jaw thrust maneuver, make CPR training with CPR Lilly PRO™ as realistic as possible. This CPR trainer has been developed and manufactured in Germany, and training with this manikin complies with the latest AHA (American Heart Association) and ERC (European Resuscitation Council) guidelines. Included with the CPR Lilly PRO™ is: 1 Android tablet PC, 1 Plug adaptor for the charger, 1 Charger, 5 Lower face masks (including teeth), 25 Throat bags, 1 Carry case and 1 Tracksuit top. Dimensions: 14.2" x 4.9" x 14.2"
The CPR Lilly AIR is a modular based training simulator for cardio-pulmonary resuscitation (CPR) and airway management through the use of interchangeable heads. The simulator has a robust construction, is easy to use, and offers realistic working scenarios. It is suitable for both medical training and first aid courses in schools and associations. It offers all the necessary features for learning about the life-saving algorithm comprising heart massage and artificial respiration for adults. All the relevant parameters can be monitored comfortably and easily via the tablet provided and stored away for subsequent analysis. This CPR simulator is also extremely hygienic: the face masks can be cleaned and exchanged easily. All material used throughout the production process complies with the highest standards in terms of quality and durability and is nonhazardous. To reach the best training results possible, various feedback methods have been built into the manikin. A tone (which can be deactivated) will sound when the correct compression depth is reached. The carotid pulse and the eye movement can be controlled individually by hand and can react to the trainee by opening her eyes when spoken to. The upper body, dressed in everyday clothing with a zip jacket, shows all the important anatomical reference points. 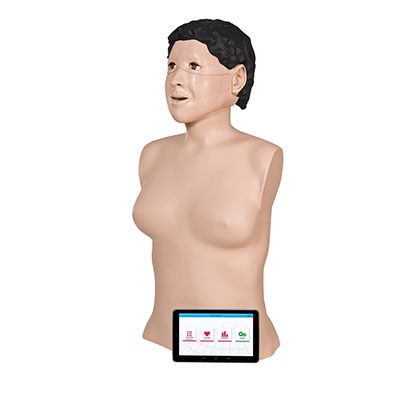 In addition to these features, the correct head tilt and the moveable jaw to demonstrate the jaw thrust maneuver, make CPR training with CPR Lilly PRO™ as realistic as possible. The simulator meets the latest CPR guidelines of the AHA (American Heart Association) and the ERC (European Resuscitation Council). Included is a CPR Lilly PRO™ training manikin, 1 Android tablet PC, 1 Plug adaptor for the charger, 5 Lower face masks (including teeth), 1 Trucorp® advanced airway head, 25 Throat bags, 1 Carry case, 1 Bottle of Lubrication and 1 Tracksuit top. 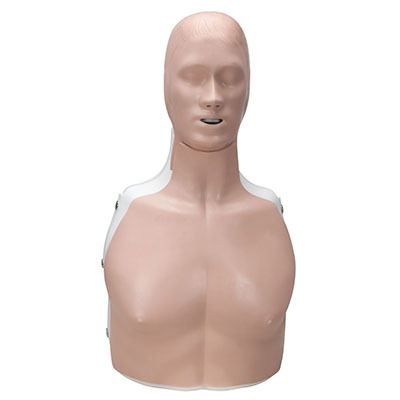 The CPR Training Manikin Basic Billy is a reliable and economic CPR training simulator. Basic Billy was developed utilizing the results of extensive studies focusing on the depth and force of compression during cardiopulmonary resuscitation (CPR). Provide help and save lives through correct cardiac massage and ventilation technique. Use it to train for both adults or children. Basic Billy is both anatomically correct and hygienic to use. 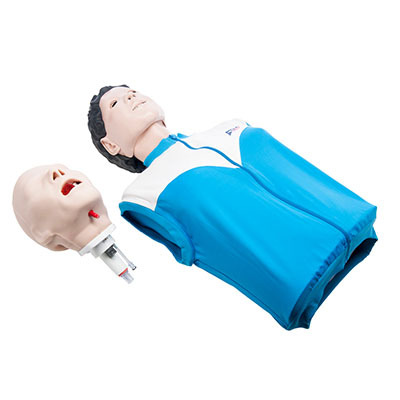 The head is easy to tilt to open the airways for mouth-to-mouth and mouth-to-nose resuscitation. Additionally, the thorax raises as the lungs are ventilated. Interchangeable springs are in the back of the trainer to give the realistic depth feedback of either the adult (5cm) or child (4.5cm). Include is a simulator (torso) with spring for cardiac massage of adults, 1 additional spring for cardiac massage of children (approximate age of 12), 5 adult lung bags, 5 child lung bags, 2 telescopic guides, 1 additional face mask and inner head for hygienic artificial respiration and 1 carrying bag.